Welcome to the The University of Alabama Bands! We know you have a lot of choices when it comes to choosing a university and we are excited you are looking into The University of Alabama. Regardless of major, there is a place for you in one of our many ensembles. The University of Alabama Bands houses the world famous “Million Dollar Band,” four large concert performance ensembles, and various Athletic Pep Bands. The Million Dollar Band rehearses Monday-Friday, 4:00-5:30 PM during the fall semester. The large concert performance ensembles rehearses twice a week throughout the fall and spring semesters and performs two-three concerts per semester in the Moody Concert Hall. Athletic Pep Bands rehearses at various times throughout each semester and performs for many Alabama Athletic events. Enrollment into any of these ensembles is open to any full-time student at the University, who completes an audition and is selected to participate in the ensemble. Auditions for marching band are held during the spring semester (February-April) of the student’s senior year in high school. All concert ensemble auditions are held at the beginning of the Fall semester (August). Members of the Million Dollar Band are encouraged to audition for one of the Athletic Pep Bands in mid-late September. Performing in front of millions of fans each year, the Million Dollar Band has been a Crimson Tide tradition for 106 years. Saturdays at the Capstone would not be the same without the excitement provided by the 400 members of the Million Dollar Band, which is one of the most respected university marching bands in the country. Members of the Million Dollar Band are majors in almost every school and department within the University and the Million Dollar Band is easily the largest student organization on campus. In addition to winning the Sudler Award in 2003, which designates the “National Champion” of collegiate marching bands, the Million Dollar Band has been invited to perform exhibitions all over the country. The band traveled to Atlanta in October of 2007 to perform exhibition at the Bands of America Regional Championships and to Indianapolis in November 2017 to perform exhibition at the Bands of America Grand Nationals. For information about auditions, CLICK HERE. Four outstanding concert performance ensembles provide students with numerous performance opportunities. 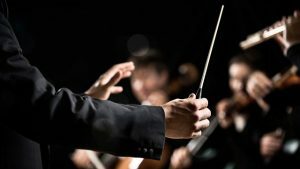 The Alabama Wind Ensemble, Alabama Symphonic Band, Alabama Concert Band and Alabama University Band each provide various concerts per semester and perform a well-rounded repertoire which includes both established wind band classics and dynamic contemporary literature. Membership into the Wind Ensemble and Symphonic Band is awarded through auditions at the beginning of the fall semester while membership into the Concert Band and University Band is awarded through auditions at the beginning of each semester. Any full-time student, regardless of major, is invited to complete an audition for one of the concert ensembles. For more information on how you can join these bands please CLICK HERE. The University of Alabama Athletic Pep Bands are ensembles that include approximately 90 of the top brass, woodwind, and drum-set students and perform for various Alabama Athletic events in both the fall and spring semesters. The band is divided into three 30-member bands (Crimson A, Crimson B, and White) that perform at all home men’s and women’s basketball games, gymnastics meets, select softball and baseball games, and select tennis matches. 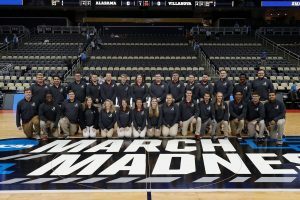 Participation in pep bands offers students an opportunity to travel with the team to the SEC Men’s and Women’s Basketball Tournaments, NCAA Basketball Tournament, and the NIT Final Four. Members are chosen by audition at the end of September from the membership of the “Million Dollar Band.” Students who participate in the pep bands receive service awards (scholarships) in the fall and spring for their participation as well as one hour of academic credit. As an incoming (new) student, Million Dollar Band and Large Concert Performance Ensemble Scholarships are offered to deserving students based upon musical ability and the needs of the band program. University Band scholarships are available to all incoming students, regardless of major, and amounts range from $500.00 to $1000.00 per year. These scholarships are renewable for up to four years as long as the student completes an audition, is selected, and participates in the ensemble. Students who perform in both the marching band and a concert ensemble are eligible for additional scholarship awards, based on the results of the concert ensemble auditions. All University Band scholarships are stackable on any other academic scholarship. Students must maintain a cumulative GPA of at least 3.0 to continue receiving a University Band scholarship. There are many different ways to get involved with The University of Alabama Bands even before you apply to the University. The Alabama Honor Band Festivals are great opportunities for middle and high school students to visit the University and interact with University faculty. Students play in concert ensembles with world renowned conductors while visiting the campus and high school seniors have the opportunity to audition for University Band scholarships. CLICK HERE to find out how you can participate in the Alabama Honor Band Festivals. During the month of June, middle and high school students can sign up to attend the Crimson Leadership Institute and Crimson Music Camps. Our camps offer small group sectionals and coaching, specialized courses, and master classes…all this while spending time sharing music with some of the most outstanding musicians and teachers in the country. We also provide our campers with a Crimson Leadership Institute and/or Crimson Music Camp T-Shirt, supervised recreation time each evening, and a fantastic finale concert. For more information and to find out how you can register, CLICK HERE. 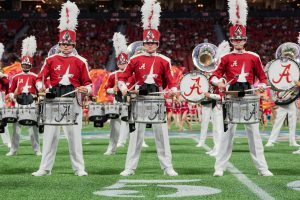 High school students (grades 9-12) are also invited to play with the Million Dollar Band each spring at the annual “A” Day presented by the Alabama Football Team. Students perform cheers and music with the MDB members at the “Walk of Champions” ceremony as well as in the stands during the game. This a great way to get an inside look at the MDB and perform at one of the most exciting events at the University. More information can be found in the spring on the MDB “A” Day webpage. For more information about these or any of our programs or ensembles, please don’t hesitate to contact us.